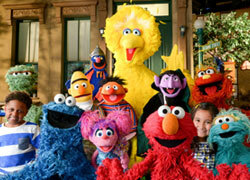 Discussion in 'Classic Sesame Street' started by minor muppetz, Jun 10, 2010. After DW McKim posted a few "Watch Along" entries on his blog I was inspired to do a similar post here, regarding the first episode of sesame street (and yes, I did ask DW for permission to do a post similar to his blog feature, and he did grant me permission). A few things to keep in mind: I watched the bonus DVD that came with the 40th anniversary book when doing this. The only thing I used for timing was the time on my laptop, so my time stamps are by minute but not second (so if I start commenting on something and no time stamp is there, it's because it was the same minute). Although I watched the DVD, I started this after the DVD intro, and did not inclue that or the DVD outtro (and I started this at exactly 1:00, pausing the DVD after the intro so I could start on the dot). Throughout this post, I mention the "first season show conetent". That's a number of files found at the University of Maryland's CTW Archives (all of which are scanned at muppet.wikia.com/wiki/Talk:_University_of_Maryland ) which I presume list every insert from the first season, listing the first season episodes that the inserts appear in (I'd like to see such files for other seasons). And now, here is my post. :00 This claymation sequence showing us the episode number is great. I’ll bet it was animated by the same company responsible for the S claymation (probably Jim Henson). It’s interesting how the theme song often has a 1970 copyright date, even though it premiered in the first episode in 1969. In fact most first season songs have 1970 copyright dates, even those from the 1969 half of the season. :01 This opening scene is a great way of introducing the show and all of the original humans, who get quick introductions. :02 This is also a good way of introducing the original Big Bird. If he started out the way we all know him now, I wonder what a good introduction would have been. Frank Oz was reportedly offered the role before turning it down. I guess if he performed Big Bird, he’d have used the voice for the guitar player from The Gogalala Jubilee Jugband. And since it was Caroll Spinney’s decision to have Big Bird portrayed as a child later on, I wonder if Big Bird would still be in his original form if Oz performed him. :03 This first Ernie and Bert sketch is great, but I can’t tell what the educational purpose is. The First Season Show Content lists it under “Self-Esteem”, but I don’t know what it has to do with self-esteem. :07 These dot sequences appear throughout the episode. They are good, but get tiresome after awhile. All of Jim Henson’s baker films are great. That’s Jim Henson juggling, making his only on-screen appearance on the show. I know that Jim Henson voiced the baker in these segments, but did Jim Henson perform the “three crocodiles” man’s voice? It sounds a bit like the father from Five People in My Family, and that man sounds different in the other Baker films (where he doesn’t shout). :08 Was this set used for Susan and Gordon’s apartment after season one? It seemed to be different in the 1980s and 1990s. :09 This first episode is really great. I think I watch this episode all the way through more than any other episode on DVD (usually opting to skip to favorite chapters for other episodes). I like probably 90 percent of the episode’s content. Some inserts have limited appeal. But this milk segment is my least favorite thing in the episode. It’s slow by comparison to everything else. I also don’t care for the introduction to this film. There are other things in this that have limited appeal to me. :12 For most of the first season, each week would normally be sponsored by the same letters and numbers, with certain segments shown several times in the same week. And while the letter sponsors would be in random order, the numbers would sponsor numerically. I wonder why that is. :13 The first season is the only season where episodes were sponsored by two numbers. The pairing of numbers would always be the same: 2&3, 4&5, 6&7, 8&9, and 10. I don’t know if 1 was a sponsor then. Most fans claim 1 wasn’t a sponsor until the 1980s, yet Muppet Wiki lists 1 as a sponsor for episodes 86, 116, and 121. I always thought it was odd that 1 didn’t sponsor the first episode, but 2 and 3 did. :15 And it’s the first repeated segment of the episode! :16 This is Oscar’s debut, and is it just me or does Oscar seem both friendlier than usual and grouchier than usual? That’s a feat! That first Oscar puppet sure does look cuddly for a grouch! And his trash can looks shinier than it would later on. :17 This “A Little Bit at the Beginning” segment was not originally in the first episode. It debuted in episode 3. But it is a great song. I’m thankful we can see this original version. I guess that’s one good thing about the DVD release omitting things, because otherwise we wouldn’t have this. :19 I really like this claymation. I think Jim Henson was involved with production and animation, but I don’t know for sure. Whenever his non-Muppet contributions to Sesame Street are brought up, these are never mentioned. The first season show content lists a “Henson claymation” under E, which I’d like to see (the files list “DUMP” by it, implying it wasn’t shown after this season. In fact were any of these shown after the first season?). :20 Hubert the Snowman’s voice sounds familiar. I think this is the only video footage fans have of this Jennie character. :21 I like the music in this “over, through, around” film, but it seems to have the quality of something I’d see on a public domain tape. :24 According to Street Gang, it was initially decided that Sesame Street would not have a host, but judging by this episode, the test pilot, other early season premieres, and the Mad Magazine parody Reality Street, it seems to me like Gordon was basically the host for the first few years, until Roscoe Orman took over the role. :25 These dot cartoons were animated by Clark Geshner, who wrote the music for You’re a Good Man, Charlie Brown. :26 This Alice segment appeared in The Sesame Street Book of People and Things. According to the 40th anniversary book, they were animated by Ken Snyder. :26 This Anything Muppet introduction is probably my least favorite Muppet scene from this episode. I don’t know why, but it is. :27 That’s Caroll Spinney as the mother. During the first two seasons it was common for Caroll Spinney to perform the occasional anything Muppet, monster, or other one-shot role. Afterwards, he would mostly stick to Big Bird and Oscar, while occasionally having other minor recurring roles like Bruno, Shivers the Penguin, and Granny Bird. It seems to me that some of Spinney wasn’t too confident with some of his Anything Muppet roles. :30 It would be interesting to see how the music notes in these dots segments were timed. :31 Many of the scenes in this seem to have connections and references with other scenes. In this one Ernie gives compliments to the cow. And now we’re seeing several 2 segments. 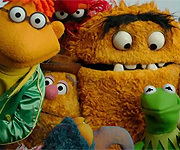 :32 It would be great if Sesame Workshop or The Jim Henson Legacy would provide a list of all the people from these first season Henson films. Many appear several times. I would assume all of the baker scenes were filmed in one day, which means that a janitor must have been hard at work that day, cleaning up all the messes. :33 The upcoming animal pairs film was in the test pilot, with Gordon providing narraration and introduction. Since he was recast, this introduction and the voice-over is from Susan and that kid. I wonder if the street introduction was used in other episodes with this segment, or if we just heard voice-overs. :34 I really like these Jazz Numbers segments. It’s a shame that Jazz #2 is the only one released on DVD. I would have expected the 40th anniversary DVD to have had one of them, but no. :35 I estimate that 40% of these street scenes could have been repeated as inserts, but this one with Ernie and Bert is the only one listed in the first season show content. And even that lists this as the only first season episode with it. It would be hard to show this one often, as 2 and E would have to be sponsors, but those two sponsored the whole first week. Why not show them in episodes 2-5? :36 I don’t really care for this E segment. And it seems more like a poem than a lesson in the letter E, rhyming many E words. :38 Does a person really need professional help to hang a picture frame? Man, those adults seem kind of mean when they talk about Buddy and Jim. I’m not used to seeing them make teasing comments towards others. The first season show content pages categorize most segments by educational subjects, but the Buddy and Jim segments are listed on their own pages (though it seems the two were still present in segments listed elsewhere). And the Buddy and Jim pages have “DUMP” written in big letters. It’s a shame that their segments weren’t repeated post-season 1. I would like sesamestreet.org to add some of them. :40 One of the first season show content files has a segment listed as “Jim: Big and Little”. I assume that’s the Jim from this duo, in a segment without Buddy. Buddy looks like the dumber, more comical one. So why does he get first billing? :41 Buddy could have just told Jim that the bird was standing, and maybe draw a line to represent ground. Is the background in these dots segments black or dark blue? I can’t quite tell what these dots segments are teaching. First season show content lists them under “auditory discrimination”, but I don’t see what these have to do with discrimination. :43 I wonder why Kermit’s hands are attached to Kermit’s hips in this scene. We’re about to see some segments about the letter W, but I don’t mind. I like the letter W. Maybe because that’s my last initial. Maybe I should join the national association of W lovers. :45 I just noticed Kermit’s hands coming off his hips when he jumps off. Guess they weren’t attached. Wanda the Witch is the first segment from this episode I can remember seeing, in the 1988 video The Alphabet Game. Many of the objects in this segment are sort of shaped like Ws. More subliminal advertising? :46 This Kermit W lecture is among my favorite Kermit segments from the first season, and I really like most first season Kermit segments. :47 Wow, Cookie Monster keeps turning the W into letters that aren’t sponsoring this episode. Shameful! Is it just me or is that Cookie Monster puppet different from what would be used for most of the first season? I assume that’s Frank Oz performing Cookie Monster, but he never talks here, so I don’t lknow for sure. But what if it’s Caroll Spinney? :48 The letter and number cartoons were most treated like commercials, so it’s a wonder that Wanda the Witch begins with a narrarator saying that the story is sponsored by W. The opening where the letters go up to W is interesting. I’d like to see more that begin like that. Nancy the Nany Goat is very similar, but the beginning starts with N.
:49 Carol Burnett’s cameo here is rather pointless. It’s just a brief celebrity cameo. Then again, most season one segments are just brief reactions to films, or celebrities counting or saying the alphabet. :50 According to first season show content, these Kermit W skits were only in one other first season episode, episode 61. And I don’t think Muppet Wiki lists any post-season one episodes with these. Were they shown post-season one? It’s especially odd they were only in two season one episodes, considering W sponsored so many first season shows. :51 The first performance of One of These Things, featuring the episodes two biggest sponsors. The first season had several versions of this song, but the only one I saw listed in the first season show content features Ernie and a monster (which one? ), involving a musical banana. I’d like to see that one. :53 This W-worm segment was in an episode from either season 30 or 31, making it the longest-running segment from this episode. :54 This is a good way of ending the first episode, but it’s a shame they didn’t mention Sally meaning Buddy and Jim. Wanda the Witch was mentioned, but Buddy and Jim couldn’t be? I wonder why this show originally only had end credits on Friday shows. I must say, at times doing this was a little hard. Depending on how much I had to say at times and how frequently I had to write something else, my hands tended to get sore. I guess that's one good thing about that long milk film, it gave me time to rest my hands and not have to hurry when writing things. Before I started this, I was thinking about what to write about in my head (I wonder if DW does the same for his similar Muppet Show posts on his blog), and there was a lot I had to "say" which I didn't have room for (or forgot about until later). I would like to do a similar one for another episode that's on DVD. This first episode is easier for me to remember everything in it and sequence order and such. With other episodes, there tends to be films that I forget about after watching them (and not just the kind that seem forgettable), and some segments I keep forgetting which episodes they are in (like "She'll Be Coming 'Round the Moutnain"... Right now I know it's in episode 1096, but I might forget that later). I keep forgetting what comes before Sesame Street News: Humpty Dumpty and Roosevelt Franklin: Talkign Loud/Talking Soft in episode 796 (I know the rhyming ball segment comes before one of them, and I think that bus stop cartoon comes before another). So in other words, if I do something for another episode, my writing/observations would probably be a bit more spontaneous. Still, this episode feels shorter than the other "old school" episodes I've seen, or that maybe the sketches are a bit longer. Part of it might have to do with a few segments being removed, and part might have to do with some of the sketches being multi-part (though only two of them are).